The Irish News has topped the circulation figures league table for regional dailies following the publication of today’s six-monthly ABC figures. The News led the way when it came to year-on-year change in circulation – although no title posted an increase between July and December 2018, when compared with the same period in the previous year. The Belfast-based News recorded a 5pc decrease, followed in the rankings by the Paisley Daily Express and Brighton daily The Argus which both revealed 6pc declines. As well as The Argus, four other Newsquest dailies – the Swindon Advertiser, The National, Bournemouth Echo and Carlisle News & Star – also appeared in the top 10 places. 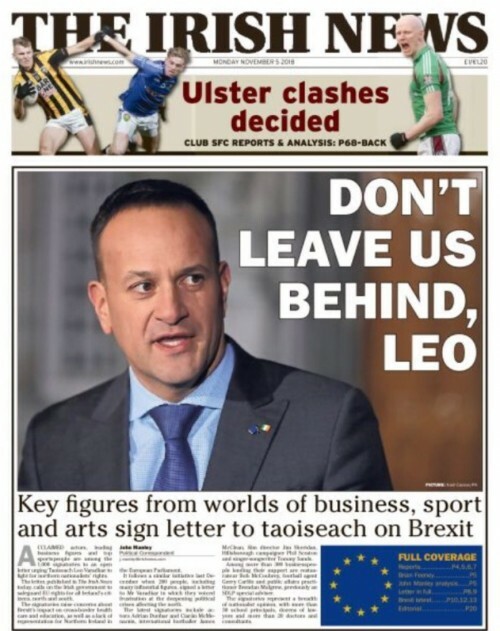 An analysis of the figures by HTFP, focusing on retail sales alone and stripping out bulk sales and free copies, also has the Irish News topping the ‘alternative ABC’ league for the third consecutive time. Based on these figures, many of those occupying the top 10 positions remain the same – although the North Wales Daily Post replaces the Carlisle News & Star. Aberdeen daily The Press and Journal has held its ranking as the highest selling regional title in the UK, despite a 9pc decrease in circulation, selling an average 43,746 copies daily. DC Thomon stablemate The Courier, which covers Dundee, Angus, Fife and Perthshire, is now the number two highest selling regional title based on paid for copy sales alone, although the Manchester Evening News and Express & Star have a higher circulation if bulk sales are included. Richard Neville, Head of Newspapers for DC Thomson Media, said, “These are challenging times for everyone and the ABC figures reflect that but we are delighted nonetheless that The Press and Journal remains the biggest paid for regional title in the United Kingdom and has now been joined in second place by its sister title The Courier. The full list of regional dailies in order of circulation decrease is below. Scroll down to the second table to see the figures with the bulk sales and free copies stripped out. Appalling figures. This is what happens when you give your content away for free and chase the digital penny. Yet more truly truly shocking losses by Archants Norfolk dailies with the EDP down another 12% to a staggering 25,600 copies out of an area potential of just short of a million people,this has to be cause for alarm bells to ring loudly and for the board to take immediate action after allowing the title to crumble over a few short years,that level of sale cannot be justified as a viable publication in it’s present form, it just doesn’t make any business sense whatsoever. As for the embarrassing Norwich Evening News at little over 6,000 copies that must mean imminent closure to prevent even more losses being accrued. The only viable course of action for these dying titles has to be merging and going free, go digital on line only or closure. I would think the company founders and prestigious editors of old must be turning in their graves. Tellingly, Prospectus, these figures come out on a day when the Norwich Evening News’ splash is one which was all over the website the previous afternoon. Tell me any other business which would give away all its products on day one and then charge for them on day two? This is what happens when you put it all on the web free before it’s in print. Glad I’m out of it, embarrassing figures, but I bet they are raving about the Facebook likes! No matter how brilliant newspapers are, and many still are, younger people just won’t buy them. Their lives are online. Excepting one or two cases, these figures have nothing to do with bad decisions or poor management, they simply reflect what’s happening in the real World. In my experience today’s senior editorial staff are far more resourceful, creative and entrepreneurial than those that came before them. It might be time to give them a break. No one, as far as I can see, is blaming bad decision making etc on these latest losses and yes the dreadful performance figures do indeed reflect how people access news these days and these figures show hardly any do this via a local paper,the issue now must be how long can these papers be propped up and continue as newsprint publications, incurring costs and losing money,when so few people, young or old,for whatever reason, are buying them? Irrespective of how resourceful you feel today’s department heads might be, the fact is they’re presiding over papers which have lost their markets,aren’t profitable and which have little or no chance of recovery,that’s the reality of the situation and is the issue which the boards need to adresss pdq before further losses at this current rate of decline equate to titles closing and even more job cuts being announced. Still can’t believe the number of commenters who think circulation loss is due to publication of stories online prior to print publication. Classified ads, classified ads, classified ads. It’s all about the classified ads. It jus a sad fact of life that people are not buying papers in the way they did even just a few years ago. Apart from the impact of technology and digital another reason is that many of them are just not seen as their local paper. For example, my local paper has just moved 15 miles away – how can that work when reporters are also being told to stay in the newsroom and are not getting out and about making contacts. so many “daily” papers selling a pathetic 10-12,000 a day, some in catchment areas of more than a million people. Surely they would better off as weeklies especially as their stories are usually shoved on their websites the day before, as remarked elsewhere? wordsmith, on this I agree with you. Readership is all about relevance. For the most part, technology and consumer habits are to blame but with reporters based way off patch and rarely engaging directly with their readers, it just compounds the issue. Still can’t believe any commentator would think that circulation loss ISN’T due to stories going online first. Nobody ever just bought a newspaper for the classified ads alone. That Cambridge News loss is shocking. Paid subscriptions which were taken out to walkers and delivered through the door by them daily have pretty much halved in 5 years. I honestly can’t see it going on as a daily for much longer especially if they see web traffic increasing and the switch to weekly or bi-weekly will soon come. Formerloyalfollower. And once superb papers like the Brighton Argus, scraping along on 10,000 a day against peak of 116,000 a day and still heading downwards. No blame attached to staff. Lousy management. Oliver and Wordsmith are ultimately correct. Despite many years’ employment in journalism, do I ever buy a paper? No – I’ve given up on local titles because I just read them online, and I might occasionally get a free national at a certain supermarket which still gives them away for spends of £10 and over. And if people such as myself can’t be motivated to buy them, why should anyone else be expected to do so any more? And with sales of barely 18,000, can the likes of the Yorkshire Post even claim to have any political clout these days? It is a shame that The Paperboy constantly batters the achievements of The Argus in Brighton. The Argus stats over the past two years have been industry leading in print and online. Brighton is a digital city my friend, take a more rounded view. You remind me of the dinosaur that is Roy Greenslade who constantly talks about the past of The Argus and ignores the fact that all newspapers have declined at around the same rate over the past 30 years whether national or regional. All gone in a decade’s time, some sooner, especially those recording 15pc-plus losses. RIP regional newspapers. Watch the circulation of the Argus decrease in the next year. It’s been taken over by the senior team which is driving their Essex papers into the dust. That goes for online too, despite it being hailed as the future. Newsquest’s ability to kill its own semi-successful products is breathtaking. your birth was announced in your local paper, your graduation, engagement and marriage. You got your first job, flat and car by scouring the local, newspaper and, when your time came, your death notice and funeral were carried in the BMDs’ section. Life was local and classified advertising was the “news you use” that added value to the newspaper. it had a good run, lasting about 50 years and making obscene amounts of cash and driving circulations…be honest, your biggest selling day always revolved around Jobs or Homes sections, not council meetings. All the investment in the world, unlimited staffing and groundbreaking editorial will never recapture that engagement level. its like moaning about the quality of typewriter ribbons being the reason why people are using computers. if publishers wish to keep their brands alive they have to follow the audience…and that audience, regrettably, now lives online and doesn’t like paying for content. The publishing of the ABC figures every six months shows graphically just how few copies nowadays are being sold and how local newspapers are no longer the go to source of local news yet they still persist in pushing out tired,irrelevant papers hardly anyone’s buying,incurring costs and losing money, why? The bigger publishers were set up as print mediums and still are to a great extent, with news migrating online they simply cannot adapt their offering to make it a viable commercial online operation despite years of trying everything they can think of to do so, whether we like it or not people find their news fix online and for free, the figures some of these papers are recording (EDP , EADT, NEN) are shocking and must force the boards to take action by converting paid for to free,going online only or merging titles,if not at the current rate of decline ,the papers will vanish of their own accord within the next couple of years max taking more jobs as they do so. I was careful not to criticise the Argus staff who do a great job in the circumstances. Its historical decline is not unique but is dramatic. Brighton might or might not be a digital city as you claim but how much hard cash are all the clicks bringing into the coffers? We never see. See comments from Phoenix Sub. Given that the regional press industry gave all who comment on HTFP their careers, including yours, I do not understand why anyone would want to belittle the efforts of those; who at all levels of the business are trying to do their best in the most trying of circumstances. We should all be championing the industry. Change is inevitable, embrace it. What a terrible run for the Express and Star. It wasn’t that long ago it was selling over 100,000 a night. Surely it can’t sustain losing nearly a fifth of its print audience every year? Let’s hope the change of leadership has brought some fresh ideas. Of course you can’t judge papers on their printed sales alone, it’s not where the new audiences are, but the rate of decline for those at the bottom of this table shows it’s far more than just evolving tastes. This is rejection of a brand, format and content on a devastating scale. And if the quality has dropped in the paper, you can guarantee it isn’t any better in the online version. Darwin. At risk of repeating myself I did not demean the efforts of the current Argus staff, just put it in historical perspective. If you were a hack doing a business story you would expect a firm to justify any claims about success with some hard cash figures. Why is a newspaper any different.on its digital claims? I know Brighton well but visiting its centre regularly have never become aware of its digital importance, so thanks for enlightening me. I certainly wish all regional papers/websites well. Our communities would be poorer without them. If you were a regular visitor to the the Argus newsroom you would be aware of the signage at the entrance to the building which outlines The Argus’ penetration of Brighton which is driven by its online audience. All regional newspapers are increasing/replacing audience in this way. Some are better at monetising this audience than others. But it is the future Roy and you should take this into account in future posts.